Store the least frequently used items in the back of the unit. The things that you use the most should be easily accessible and stored in the front. 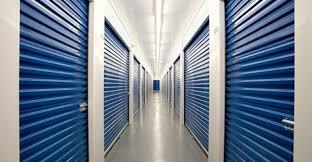 If you have room, stack boxes along the sides of the storage unit leaving a space to walk in the middle. This will make it easier to access all items. Label boxes clearly on both the top and sides. Finding a specific item will be much easier if your boxes are properly labeled, circumventing the need to search through every box to find what you need. Keep like items separated into sections. For example, if you are storing the contents of a home, keep kitchen items together, living room items together, bedroom items together, and so on. Use specialized storage boxes for things like clothing and tableware. Wardrobe boxes come with a built in rack to hang clothes from, and dish set boxes are sectioned off inside for each individual dish. If you do not have these type of boxes, most self storage facilities have an on-site supply center where items such as those can be purchased. Stack heavy boxes on the bottom and lighter boxes on top. Not only will this make access to the boxes easier, it will also prevent heavier boxes from crushing lighter ones. Make a list of items that are stored in each box, making note of what the box is labeled as and where it is located within the storage unit. Having a master list like this will make finding specific items a breeze. Store heavy items such as couches or washer and dryer against the walls. These items aren't easily maneuverable, so you don't want to have to try to get past them when you are looking for something. If you are storing items belonging to more than one person, use different color markers to label the boxes. This will make it easy to tell the difference between your kitchen items and your roommate's kitchen items for example.